Needless to say, he is still the same way and he takes a while to warm up to any new situation! I am extremely grateful that I didn’t give up on swim lessons. Eventually, he started smiling and really enjoying the water! Swim lessons became a weekly routine in our family and he started swimming on his own with his face in the water when he was 3-year-olds! My daughter started swimming lessons when she was 16 months. We tried the parent/child class but she kept pushing me off of her because she wanted to swim on her own. Talk about a completely different child than my son! She was my little spunky, wild, social go-getter. I couldn’t handle parent/child classes with her so I put her in a class with my son which was for 2-year-olds without any parent. Boy, was she ready for that! I did have to sit next to her for her safety when the teacher was out with another student, but she really excelled in that class. She started swimming on her own when she was 2 and she even dived down to retrieve rings in 3 feet 5 inches of water! She was a little fish from the moment I put her in swim class! We started going to Florida to visit my grandparents when my son was 2 and my daughter was 9 months old. That very first trip my son fell into the pool minutes after we arrived and he floated to the top of the water and started reaching and kicking to stay above the water. I was very happy to see that he didn’t just sink down to the bottom of the pool and do nothing. Every year we still go to Florida and my kids are little fish in my grandparent’s pool swimming from sun up till sun down! It’s great that they know how to swim and enjoy it so much! The summer after my daughter started swimming independently my dad invited us to Wisconsin Dells. It was my family’s first time in Wisconsin Dells and we had no idea what to expect. We stayed at the Wilderness Hotel (which is still our favorite to this day)! My husband and I love the sun so we skipped the “kiddy pool area,” and went straight for the big pool while our 2 and 3-year-old kids followed. We were pumped when we saw lawn chairs sitting in the middle of the big pool. We put goggles on our kid’s, got into the water and all headed to the center of the pool. My husband and I parked it on the lawn chairs while my kids jumped off of the ledge and into the deep pool, swam back, pulled themselves out of the water, and repeated this until they were all shriveled up! No lifejackets, water wings, or any other floatation devices were used. It was awesome! Lifeguards crept closer (until they saw how strong of swimmers they were) and other families stared as our tiny little kiddos had a blast doing their own thing in the big pool! 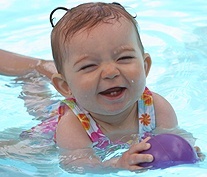 Are you interested in swimming lessons for your little one? Take a virtual tour of a Swimtastic location! Register today to learn more information and find a location in your area!